World’s 10 costliest cities to buy real estate… where Dubai? Turkey registered the highest increase in residential property prices in 2015, according to Knight Frank Global House Price Index. Prices rose 18 per cent between Q4 2014 and Q4 2015, the UK-based consultancy said as it is it is viewed as a safe haven for Middle Eastern investors, bridging East and West and also seeing strong population growth. Dubai, which was among the top cities on the global price index in 2013 and 2014, registering double digit increases, has now become an affordable place to buy real estate after prices declined 5.5 per cent. The Wealth Report 2016 also placed Dubai ahead of cities such as Shanghai, Paris and Sydney to take the sixth spot on the list of top 10 most important city for the Ultra High Net Worth Individuals. 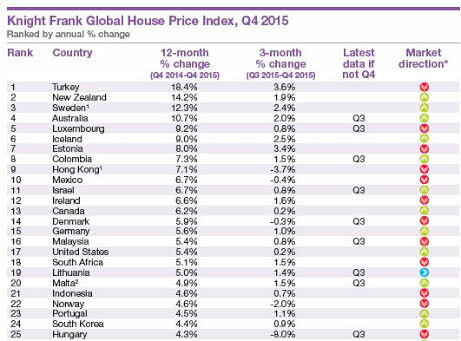 The global house price index increased by 3 per cent in 2015, up from 2.3 per cent in 2014. Concerns over the global economy in 2015 failed to dent buyer confidence; instead the lingering low interest rate environment influenced sentiment. “Forty-three of the 55 housing markets tracked in our Global House Price Index saw prices rise, up from 10 countries in the aftermath of the Lehman’s collapse in Q2 2009,” said Kate Everett-Allen, partner, international residential research, Knight Frank. Although house prices in Hong Kong increased, the rate of growth has slowed significantly from 17 per cent in the year to September to 7 per cent in the year to December 2015. The slower rate of growth is attributable to rising supply (more than 11,200 homes were completed in 2015), as well as China’s financial market volatility and the expectation of increasing interest rates. Australasia was the strongest-performing world region, buoyed by the strong performance of New Zealand and Australia, both of which saw annual price growth in excess of 10 per cent. Housing affordability, or the lack of it, is rising up policymakers’ agendas worldwide. According to the latest data from the OECD, which measures house prices against incomes for 24 of its 34 members, Belgium and New Zealand are currently the world’s least affordable markets, while home ownership is most accessible in South Korea and Japan. “Our outlook for 2016 is muted. We expect the index’s overall rate of growth to be weaker in 2016 than in 2015. The global economy is experiencing a potentially dangerous cocktail of low oil prices, a strong dollar and a continued slowdown in China,” Everett-Allen added.